My recent visit to Les Sept Laux spurred me on to check out Chamrousse, another Chaîne de Belledonne ski station. 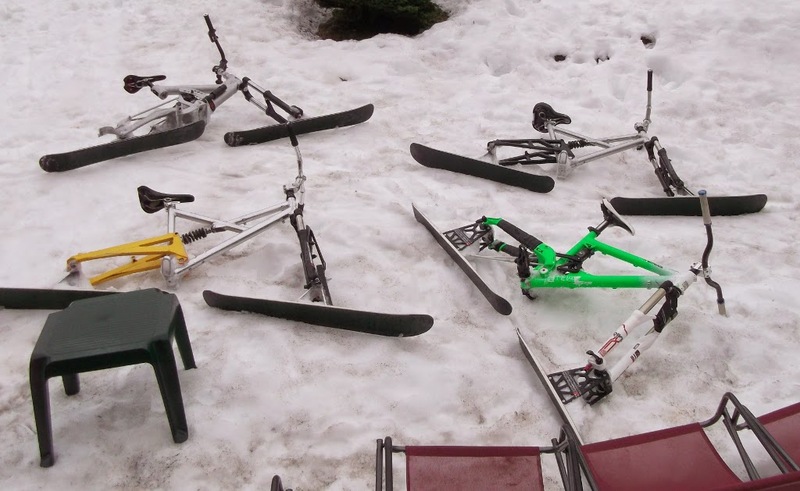 I checked the Chamrousse website last night and they listed a selection of SnowScoots allowed on the lifts, but I couldn't see any skibikes listed. I decided that I would give it a try anyway and in the worst case scenario I would be getting in my second day this season on skis. The weather has really closed in in the last 24 hours and as I left Allevard the rain was falling in near biblical proportions, I could only hope that this meant fresh snow at altitude. Chamrousse is quite close to Grenoble at the Southern end of the Chaîne de Belledonne, it is a fun drive up through the forest from the valley floor, with a wide single carriageway road. I stopped at the first accessible chairlift and checked with the operator whether my skibike would be allowed, he had never seen anything quite like it, so radioed the boss. Perhaps it was the bad weather, perhaps it was end of season, or perhaps Chamrousse is one of those places where they're prepared to give a paying customer a chance, but the boss said that if I had a leash he could see no problem. In the ticket office I was warned me about the weather conditions, with no visibility and driving snow at the top. They laughed when I explained that it would be like a summer's day in Scotland. As promised, the weather at the top of the chair lift was apocalyptic but just to get in one ride would have counted as "mission accomplished" in my books. Chamrousse has a variety of gentle runs through the trees at the lower levels, the more advanced runs are accessed from a second stage chairlift or directly from the base station by a gondola system. Given the lack of visibility, it was probably just as well that I had to keep to the easy slopes. Seeking some shelter, I found a pleasant forest run called Coqs and went over it enough times to learn the bends and be able pick up a bit of speed without really being able to see where I was going. In conclusion, Chamrousse could be a great place to skibike, with a good mix of runs and offering good value for the budget concious skibiker. I have asked Thierry if he can to contact the lift operating company and hopefully get skibikes added to their list of approved rides and make Chamrousse another skibike friendly resort for next season. Continuing the theme of testing the skibike friendliness of sundry ski stations, my focus of interest has shifted to the Chaîne de Belledonne. As the title of this post might suggest, it is indeed somewhat off the beaten track, although not really that remote. The Chaîne de Belledonne is a narrow ridge of mountains, with Chambéry at the Northern extremity and Grenoble at its Southern end. To a foreigner this would still be part The Alps, indeed there are many well known resorts just 50km as the crow flies to the East. But in many ways this area is a World apart, much in the same way as the Auvergne or Jura mountains are. I decided to make the Hotel du Parc, situated in the spa town of Allevard les Bains, as my base camp for this expedition. Allevard is a charming little ancient spa town, more likely to be visited in the Summer for the curative powers of its spring waters, than as accommodation for winter sports. Allevard has its own compact family skiing area, the Colett d'Allevard, just 7 km above the town, but as it is quite small I have decided to give it a miss this season and focus on Les Sept Laux some 30 minutes away over the Col du Barioz. Surrounding Allevard are peaceful working agricultural areas, which have probably not changed much since Napoleon Bonaparte strutted his stuff. Up on the ridge, high above the small farming communities, Les Sept Laux is to be found. Les Sept Laux is very low key compared to the posh resorts, more of a ski station, with a cluster of low density, modern apartments all sympathetically designed to match the environment. My companion for the day was to be John, who though relatively new to the sport, is already a far better rider than I will ever be. We picked up our lift passes, which cost under €25 and headed for the nearest chairlift. There were no issues once we had shown the operator our safety leashes and without further ado we were off. As we worked our way around Les Sept Laux it was immediately apparent that a good deal of investment has been made in the infrastructure, the majority of the chairlifts were of the detachable design, with just the one speedier example. There was the typical mix of differently graded runs, many erring on the easier end of their grade. As has been typical of this season, the weather conditions weren't the best, with overcast skies and hill fog at altitude. The lack of visibility tempered our speed somewhat, but it was apparent that for the time of year and relative to other resorts, the quality of snow was much better both on and off piste. There was slushiness closer to the resort, but without the rocks and branches I have witnessed recently at other similar places. As our start had been somewhat tardy, we skipped lunch and rode on, but by mid afternoon it began to snow at altitude which turned to rain lower down, so we called time around 16:00 and headed back to our vehicles. In conclusion, Les Sept Laux is a great spot for skibiking; the quality of the infrastructure, the scale of the area, value for money and great snow conditions all stand in its favour. We found little to fault, perhaps if you only wanted extreme riding, then you might have to look elsewhere. Otherwise, might I be so bold as to suggest that you broaden your horizons and consider heading off the beaten path to Les Sept Laux. Avoriaz was one of the first skibike friendly resorts that I visited in France and has become somewhat of a perennial favourite, it's always a cool place to go and the snow is always good. I can guarantee that I will spend a day or two here each season, no matter what other delights are offered. Today's ride was somewhat of a reunion; as blog co-writer Wayne had come out for a long weekend to join me, Thierry had made his way over from the Aravis area and John all the way from the 3 Valleys. Group rides always have a different feel to solo expeditions, sometimes you are spurred on to get out of your comfort zone and try new things. We spent a great deal of the morning cruising around the pleasant long runs below the Pointe de Voriaz, but the highlight of the day was to be found heading of the top of Les Haut Forts. After all these years I had never tried the Coupe du Monde black run, this is where World Cup skiers hurl themselves flat out down the fall line in search of glory. I was quite content to take my time and get down in one piece, it is a steep run following a ridge line. The vertiginous drop-offs to each side are intimidating and you had better get your turns in on time, as it's a long way down. On the plus side the snow was in surprisingly good condition and there was enough grip to have control. Feeling fiesty, we returned to the same starting point and followed the SnowCross Crozats route, a steep, un-groomed "big mountain" run that had given Thierry and I a near death experience a couple of years ago. I am merely a survival skibiker, I will give most things a try and am not ashamed to cheat by getting off my skibike and turn it around to face the other way when I feel it is too steep to make a turn. I was humbled to be so out-classed by the talent of the other riders, it was like watching an instructional video all the way down. You know a run is gnarly when it leads onto a black graded run and your first thought is "phew, now I can relax a little". We had passed the ski lifts of Châtel en route for our morning assessment at Champery, so it would have been nothing short of churlish not to have stopped on the way back for an afternoon ride. Châtel has been SnowScoot friendly for a long time now, I recall that World Cup type competitions have been held here. More recently it has opened up to skibikes too, for both of us this would be our first opportunity to see how the theory would translate into practice. We used the brand new chairlifts at Vonnes as our entry point into the system, which serve the sole function of connecting the two halves of the resort, which was formerly linked by a free shuttle bus service. We hastily donned our kit once more and jumped on to see what delights Châtel would have to offer the skibiker. 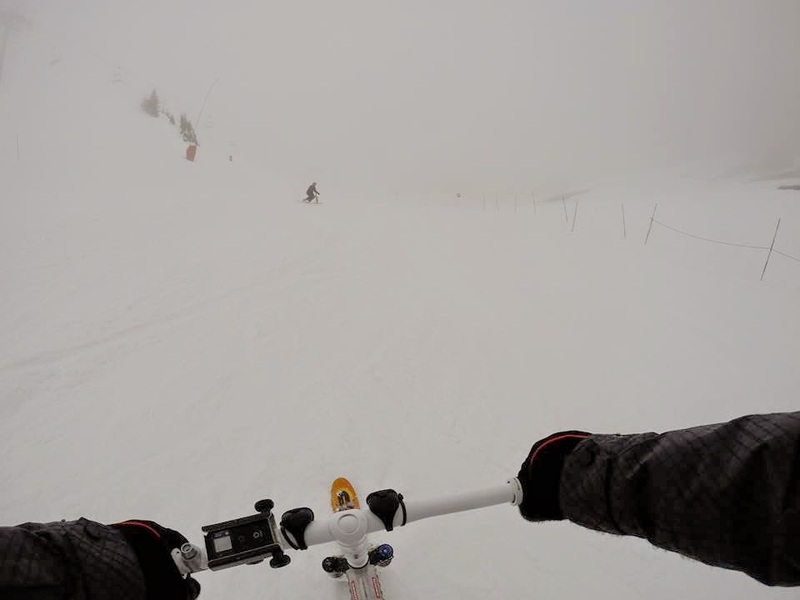 Our first run was a short forest trail leading into the resort, a complete slush-fest of a ride and although low inclined, the challenge was to switch trajectories Tron style and avoid the; rocks, mud and sundry debris scattered about. To avoid the slushiness we headed higher, which meant taking a gamble by heading into, but unfortunately, not above the clouds. The pistes were much better at altitude, but it was a challenge seeing them, so there was a fair bit of fumbling from one piste marker to the next. Slowly we worked our way around the best part of one half of Châtel, over a period of a few hours. The infrastructure was superb, with a cornucopia of lovely new detachable type chair lifts, serving a broad variety of runs. It was hard to tell in the murk, but there appeared to be a lot of nice looking off-piste in the mix, although today wasn't the right moment to investigate. I had never visited Châtel before, the Portes du Soleil domain maps give the impression that Châtel is quite a small area with just a few lifts. But I was pleasantly surprised to see just how big an area it is, to compare it with Morzine would be a fair comparison. Much like Morzine, the architecture is totally based around the super chalet template, making for a harmonious blend of architecture, with not a single hideous 70s concrete bunker in sight. Chatting with the proprietor of a local restaurant, he surprised me by saying that the majority of his clients are from the Alsace region of Eastern France. With an annual "Vignette" for the Swiss Motorways costing the same as a single trip on the French motorways; they make the entire trip using Swiss infrastructure and can be here from Mulhouse in the same time as it would take Thierry from St Jean de Sixt! We had no trouble using any of the infrastructure with our skibikes, given the broad choice of runs, I would have no hesitation recommending Châtel as a place to skibike. With skibike friendly Avoriaz and Super-Morzine adjacent and the possibility of nearby Champery opening up too, plus decent modern infrastructure and a good balance of runs, what's not to like? Today was a little different from the average tour day, Thierry is on a mission to open up all of the Portes du Soleil to skibikes; some resorts such as Avoriaz, have always been positive, neighbouring Champéry has recently allowed SnowScoots. Our objectives were to meet with the operators of the lift company, do some test rides and show how skibikes can safely use the various types of chairlifts. Champéry lies in the Val d'Illiez in Switzerland, there are a number of neighbouring ski resorts which all form parts of the Portes du Soleil domain. From Thierry's home in the Aravis mountains it's not that far to Champéry as the crow flies, but the presence of all these big hills, combined with a paucity of motorways, makes for a very long drive of 3 hours each way. At this time of year, with snow and ice free roads, it was plain sailing and sat in the passenger seat, I was able to enjoy the scenery along the way. 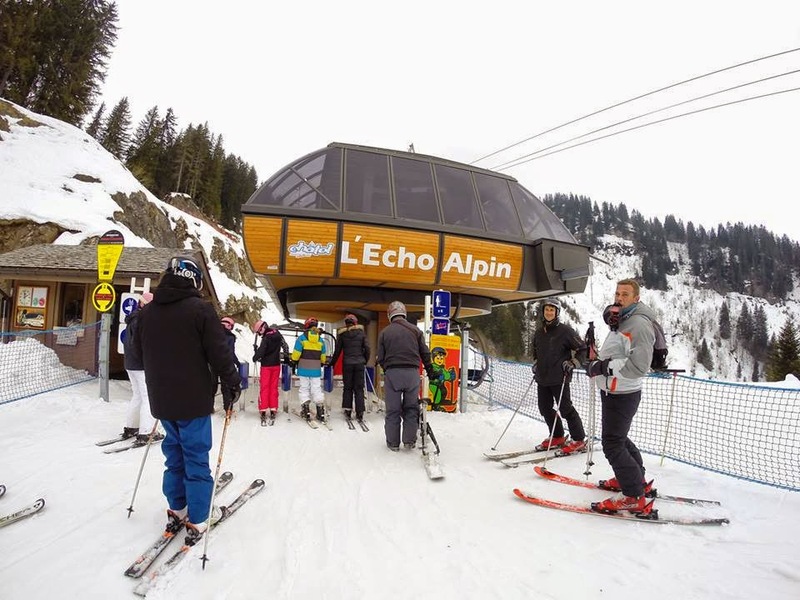 The base station at Champéry has a giant cable car leading up to the heart of the ski area, as you would expect of Switzerland everything is pristine and runs with the accuracy of a Swiss watch. We were greeted at the cable car top station by the head of operations, introductions were made and there was some general discussion about the skibikes and a quick safety briefing . 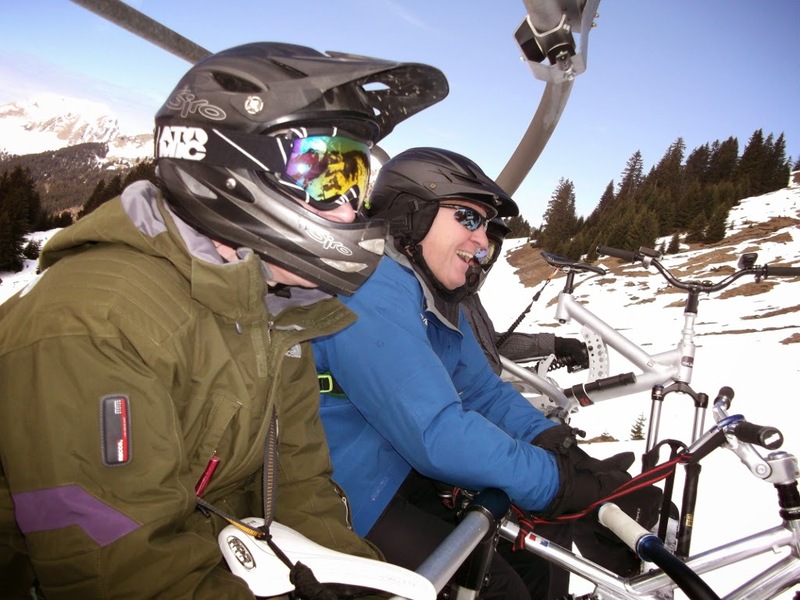 Equipped with a pair of "try me" Firem VS512 demonstration skibikes, we began a circuit of the resort, with lift operators and security personnel switching places to take a ride with us and monitor loading and unloading the skibikes on the chairlifts. Fortunately for us, Champéry has invested a great deal in modern detachable chairlifts which was a great relief, no rattly old two seater lifts here! It will be interesting to see what the decision is at Champéry, I got the impression that there was a genuine interest in skibikes, the operations team took a fair chunk out of their day to thoroughly test and inspect them. They also appeared to be having a blast on them, while they were at it too and let's not forget that this is a World class downhill mountain bike centre in the summer, where a certain Englishman did rather well in a race a few years back. Today was my first day back in the skibike saddle after a week off; my legs were once again working as well as can be expected, but my shoulder was still twinging from a recent crash and I suspect it will continue to do so for some time to come. The rain and general gloom that greeted me upon my arrival at Geneva airport yesterday morning departed and the forecast bluebird day arrived in its wake. This week could be a busy one, with a number of rides occurring back to back. After much deliberation (and blissful snoring too), whilst contemplating where to go today, I finally settled on Morillon. In the past Morillon had been little more than a convenient gateway into the Grand Massif domain, but my visit today was to be a little different. I have recently investigated some property for sale here and wanted to know how this village would fare as the new skibike blog base camp, especially with a skibike friendly resort right on my door step? Upon arrival at Morillon, I immediately felt that end of the season vibe, there were no queues for lift passes, I rocked up, handed over my money and boarded the gondola. There was no hassle from the lift operators, so it's good to know that Morillon remains just as skibike friendly as it has always been. I headed up the Sairon chairlift and straight back down for a quick assessment of the state of the snow, which was not bad, it was just past 10 am and already a thaw was established with the snow turning soft and buttery. I then made my way to neighbouring Les Carroz, I love the tree lined runs, but even the blue runs have some steeper sections and their shaded nature means that icy conditions can persist for much of the day. A missed change of edges lead to a sudden burst of unexpected speed, which served well to remind me of this fact. The Les Molliets sector was my next destination, a familiar run that I could almost do with my eyes shut, it was a gem and a delight to ride, so I indulged myself with a few circuits. I also made a quick visit to Samoens via the entertaining and by then, very slushy Dahu piste. I wanted to head over to Grand Vans and the border with Flaine for a change of scene, so made a bee line for the Vernant chairlift, but found my path blocked by a polite, but apologetic liftie who explained that skibikes are now forbidden throughout Flaine's chairlift system. This had never been a problem before on this side of the Flaine/Less Carroz divide and I was a little taken aback to come across such a negative attitude, it was like turning the clock back five years to the genesis of this blog. Time was running out, so I made my way slowly back towards Morillon at the close of day. Morillon have installed snow canons on the run down to the village; the results are excellent and there was a worn, but rideable surface all the way down. Given that it is the end of March and the village is well below 1000m is nothing short of magical in my opinion. In conclusion, if you had never visited Morillon before, how would it shape up as a skibike friendly resort? I had a great day, but it might be a bit tame for some, most of the runs are relatively easy and wide too, they will flatter your technique and make you look good. There is some off-piste with a generally benign nature, fun for playing on with little risk. Morillon is a bit too small to be considered as a destination in it's own right; you really need to go into the neighbouring areas of; Les Carroz and Samoens to realise the potential. But I would happily bring a novice rider here as a safe place to learn and have some fun whilst they were at it. On a negative note, it is a crying shame that Flaine has turned from being just skibike sceptical to outright anti skibike. I don't know the cause for the change in attitude, but if disabled sit-ski riders were treated with this level of discrimination, there would be an outrage. If the area came back on side, it would open up the skibiking potential even further. On the last run yesterday, with Jonathan safely on his way home, I unwisely "went for it" on the Boarder Cross circuit, promptly overshot the banking and went sailing into the hillside at full tilt. Fortunately my head broke the fall! Getting winded goes with the territory, but there was one short moment when I was close to vomiting, which is not a good thing to do inside a helmet. After several minutes of groaning and rolling around, I gathered together my last shreds of dignity and headed gently back to the car. Today my shoulder has a nasty twinge, but at least the stabbing pain has ceased and my left leg is stiff as a board. I did at least manage to get some pants on this morning without requiring assistance, which for the (very nearly) over 50s is a bonus, nothing is busted and there's nothing that won't heal with some rest. Meanwhile poor Thierry has let me know that someone had dropped an anvil on his foot (perhaps something was lost in translation there) and is now out of action for the remainder of the season. 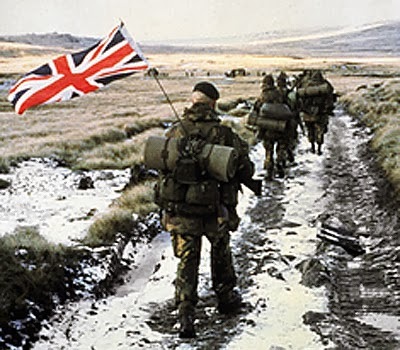 On a happier note, John has finally completed the journey down from Scotland, despite a number of nasty mechanical issues en route; furthermore on Saturday Carl will be arriving to start another British assault on the 3 Valleys, so there will at least be someone left fit enough to fly the skibikng flag next week. Meanwhile, I have to prepare to head back to England and get some proper work done in the City of London next week, but will be back for a final lap in the last week of March and could be joined by the Blog's co-writer Wayne. It's great when a plan comes together, way back in November I spotted Jonathan. He lives close to Cluses in France and was busy asking a lot of the right questions on the Internet about skibiking. I couldn't resist the opportunity to introduce myself, in the vaguest hope that he would give skibiking a go, whilst in the company of some unknown and eccentric Rosbif. Would you skibike in the company of some unknown and eccentric Rosbif? He is already a keen skier and downhill mountain bike addict, so it would only be logical to merge the two disciplines and start skibiking. Where he lives, the tiny ski station of Mont-Saxonnex is literally at his door step, whilst the skibike friendly resorts of; Combloux, Les Carroz, Les Houches and Praz de Lys are no more than 30 minutes away. He had already tried using a SnowScoot, but found the steering to be very heavy and difficult to engage the edges and really wanted a sensation closer to that of a bike. I have two skibikes in my personal fleet, they are modest machines, based on Marin full suspension mountain bikes of the 1998-2000 period. They only have about 4" of suspension travel, but equipped with modified Alpine Skibikes adapters, they have proved to be robust and fun machines to ride. There are some tiny detail differences between them, so I started Jonathan off on the one equipped with Line "Mike Nick" skiboards. The are reasonably wide boards, with a modest sidecut and are on the stiff side. They remain engaged on hard snow, drift really predictably and don't run away with you, like some of the dedicated skibike skiboards. We started with a few "leg out" turns on the bunny hill, Jonathan got it immediately, so there was no reason to remain there and we headed up the chair lift to do some easy blue runs. After a couple of runs he was well enough in control to head further up the hill to try some more expert terrain. The sun was out in full strength and the runs were soft and pliable, with a tendency towards slushiness in patches. Skibike fun at Combloux - Yessss! It was the ideal moment to try out the Boarder Cross course which had worn through in patches, so you had to pick your lines carefully. At the bottom of the run Jonathan only said one word, but it said plenty enough "Yesssss!" We stopped for a light lunch and enjoyed the spectacular views of the Mont Blanc before heading down some steeper gradients to the little chair lift at Jouty. The last time I came down these runs it was using the skibob technique riding with foot skis, so for me it was a great pleasure to tackle them once more, but in freestyle mode standing on the pegs and twitching the rear ski like a dog's tail. We finished the day on the more challenging runs to be found off the peak of Le Christomet, the Chevreuil piste being a favourite, which follows a ridge gently before plunging swiftly down into the valley; before finally heading back to the car. Jonathan had impressed me, I expected him to do well as he already has the right suite of core skills. But sometimes people can be arrogant when they are good and simpnly won't follow the instruction of someone who may be no racer, but does at least have a lot of skibiking miles under their belt. I believe we may just have found a new local ambassador for the sport. Jonathan - a new local skibike ambassador for the sport? Continuing the theme of breaking fresh ground with skibikes, the next resort in the cross-hairs was Les Arcs; a place with a long history of introducing France to the "Nouvelles Glisses" or new sliding methods. Les Arcs was a pioneer of the "progressive skiing technique", where you start on short skis and work your way up on to progressively longer ones as your skills improve. From the outset you parallel ski and never need to adopt the awkward habits of the snowplough. As someone who discovered the joy of short skis after years of pain on long ones, I think it is a brilliant idea. But then I'm not a professional ski instructor with a vested interest in keeping people learning for as long as absolutely possible. Les Arcs is also the self proclaimed "home of (French) snowboarding", this was the place where the snowboard broke out of the snow park and became accepted as an all mountain machine. To say that there are parallels with the history of modern freestyle skibikng would be an understatement. As a purpose built resort Les Arcs offers the visitor one of the easiest drives possible, along a fast, low inclined road up to the market town of Bourg Saint Maurice where you can park your car and take a rapid funicular train up to Arcs 1600. The journey is stated as 7 minutes, I wasn't counting, instead I was chatting with Alan, a retired Brit living in the area the whole year round, best keep that fact a secret from the French tax authorities Alan! The official line at Les Arcs is that skibikes are permitted to use all the detachable chair lifts, as well as the gondolas and cable cars. Hilariously one of the chair lifts even has a "no skibikes" sign, just in case you don't know the rules. In practice, Thierry and I had no problem getting around, although there was noticeable overcrowding of the core lift infrastructure, with waiting times of 15 minutes at the Transarc gondola and up to 45 minutes possible to access the Aiguille Rouge cable car. 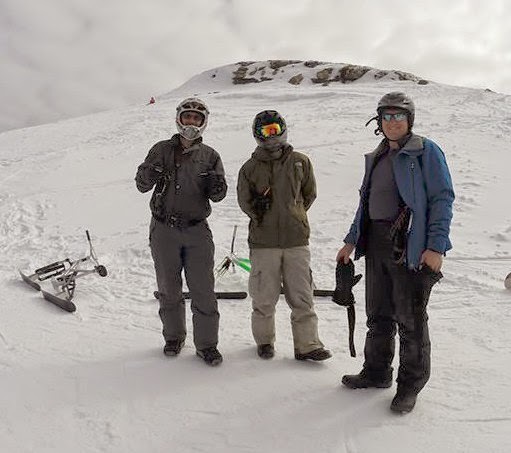 We discussed this matter over a beer and hot pannini by the top of the Grizzly chair lift and both felt that as this is a €50 plus a day resort, the cost ought to be better reflected in the efficiency of the lift system. In the morning we remained quite low at Les Arcs to avoid the queues, and enjoyed some excellent, if a tad icy, tree lined runs above Vallandry. There was no shortage of open cruising blue runs either, some of which were of the "Motorway" type, almost as wide as they were long. Ideal territory for any novice skibiker, or those who just love to traverse and hate switching edges. There were some steeper red grades, perfect for doing a spot of foot down super carving on. However the ice was distinctly treacherous on the busier "easy" routes leading into the village, making them more difficult that the expert areas in some regards. If I remember correctly the blood wagon was out on multiple occasions, just whilst we were riding about. The really expert terrain is to be found heading off the Aiguille Rouge, but having waited all day for a lull in the lift queues we only managed to get as high as the top of the Varet gondola. We could have waited a further 20 minutes, but not knowing the resort intimately, didn't want to risk missing the closure of the Bois de L'Ours connecting chairlift; so headed back to Arcs 1600 for the funicular ride back down. All in all it was a great day at Les Arcs, there would be plenty here to please a new skibiker wanting to garner some confidence building mileage. The interconnection with neighbouring, skibike friendly La Plagne would further extend both the range and variety on offer. For the expert it would be worth a long weekend visit to explore the high altitude areas and vast off-piste; some of which made my gonads shrivel. Gnarly goes nowhere near describing their intimidating appearance. But you might have to go in the off season to fully enjoy the experience, if like me, you can't stand queues. What a difference a day makes, yesterday I was riding in a small, quaint, rural ski resort and today I would be switching to the 3 Valleys, quite possibly the largest interlinked ski domain in Europe. Last season I explored the Meribel and Courchevel side, but today I would be heading to the highest point at Val Thorens. Val Thorens is somewhere I have not been since my first weeks of skiing twenty years ago, it was all so new to me then. But I recall being amazed that all the slopes were above the tree line, lending the place an ethereal lunar quality. I imagine it's all well and good when the sun is shining and the weather is clement, but it must be brutal in blizzard conditions. My companion for the day would be Kevin, who I think is now into his second or possibly third week of skibike riding. There was no real agenda, just another opportunity to mooch around the resort and have some fun. I chose to drive up as far as Les Menuires, rather than go the whole hog and use it as our rendezvous point. We found each other and set about making our way up to Val Thorens. Here's where the glitz of the 3 valleys tarnishes a little, the first lift operators we encountered didn't want us on at all, as our leashes weren't attached to our feet! We weren't going anywhere in a hurry and they let us on eventually so we would stop cluttering the place up. I suspect this part might be under the control of the same company that runs St. Martin de Belleville lower down the valley and they just haven't caught up with the skibike beat yet. Once out of Les Menuires and into Val Thorens itself there were no major issues with chairlifts to report and we didn't choose to ride any of the cable cars or gondolas. The price to ride here is high at €54.30, but then so is the altitude and it really shows in both the quality and quantity of snow. Most pistes were perfect packed down powder snow, but not overly groomed, here there are no issues with freeze-thaw cycles. But it was really the off-piste conditions that blew me away. Anything that was within spitting distance of a blue run was totally tracked out, but still a delight to ride. Straying off the more challenging red runs, were where the really good stuff was to be found. Huge mountainsides, piled high with powder snow and nothing to do all afternoon but go just a little berserk in it. Kevin managed brilliantly after I lead him onto some pretty daunting slopes and we both had our fair share of wipe outs. There again if you don't crash once or twice, you're just not trying hard enough. I even managed a few diddy jumps, I seem to be getting better at the take off, now I need to work on the landings. In conclusion, Val Thorens is a very favourable location to go skibiking if you can afford the overheads. You are spoiled for choice and can head down to Les Menuires if you want variety. Opt for the 3 Valleys ski pass and Meribel, La Tania, Le Praz and Courchevel are waiting for you. Sadly St Martin de Belleville hasn't openend its lifts to skibikes, nor has Orelle the 4th valley, but I live the in hope I will see it in my lifetime. Today I headed back out, to ride with Kevin in Val Thorens and later Thierry in Les Arcs. En route I will be stopping at somewhere I found whilst pouring over the regional map and spotted a load of lifts marked where there really shouldn't be any. The place in question is Areches Beaufort and early this year I was told that it is now skibike friendly, how could I resist the opportunity to try somewhere new? The town of Beaufort is situated on the D925, a small provincial road that forms a high mountain pass between Albertville and Moutiers. The pass remains closed in the winter, leaving Beaufort to exist in splendid isolation for much of the year. There are few other ski station nearby, Hauteluce being the closest, some 15 km away, vaguely accessible as the back mountain area of the more well known Les Contamines. It is very much a rural area, focussed on wood processing, with timber yards and mills aplenty, It is quite characterful and it is hard work to remain focussed on the road and not gawk at the sights. The ski station at Areches is just above Beaufort town; down in the valley it had been overcast, but on arrival it was exactly like a kitsch snow globe with masses of light snow floating down gently all around. I had left Geneva at 09:30 and taken the back roads route, so it was nearly 13:00 by the time I reached the kiosk all ready to ride, I was able to buy a 4 hour ticket which cost just €24.70. Areche has two detachable chairlifts, Grand Mont is right in the centre of town, there was no queue and I just hopped on, no questions asked, just a jolly "Bonjour" from the operator. At the top, there is a good choice of runs, I picked the Perches red run that leads straight to the other detachable chair called Piapolay. There was about 3 inches of fresh powder snow on top of a base of icy hard packed artificial snow, giving the run somewhat of a "Iron fist in a velvet glove" feel to it. It was gorgeous on the flatter sections, but with a bite to it on any sort of gradient. At Piapolay the only way back to Areches is via the Boullevard de liaison, a small piste that follows the river down through the woods, it is a delightful run to enjoy pretty views of the many chalets and trees. I would guess that when the snow is poor there must be a shuttle bus to serve the same purpose. I popped back to the car for some munchies and the clouds began to lift and the majesty of the surrounding mountains was revealed from behind their veil. I took this as the perfect cue to bag the black run down from the top of the Grand Mont chairlift. It didn't seem that difficult viewed from the chairlift, but once on it the pitch is unnerving, it is also rather ridge like, opportunities to run off are few and of course it's all bumps as a result. To my advantage it was all soft, fresh, natural snow so I plotted a steady path down using lots of short swing turns, although I do feel that I deserved an "I was brave" badge at the bottom. With a couple of hours left, I pottered around testing out the many trails, it should be noted that some are only accessible by drag lift, such as those on the Col de la Forclaz. In conclusion, Areches is a charming small resort, which in many ways serves as a glimpse into a less commercial past. There's no modern glitz, no giant screens shouting advertising at you wherever you look, a pleasant relief from the marketing overload that so many bigger resorts can exhibit. This type of place has nothing to offer those who come just to show off, instead there seemed to be a broad mix of all ages present, busy using all the many types of snow sliding disciplines which now includes freestyle skibiking. Blog reader Roger may also be keen to hear that there are winter footpaths, including one for snow shoes all the way to the top of the Col de la Forclaz, with an altitude of 2320 metres. It is unlikely you would want to come here for a whole week of skibiking, but there's certainly plenty enough to keep you entertained for a long weekend skibiking at Areches Beaufort.